Snowmaking at Loveland over the weekend. 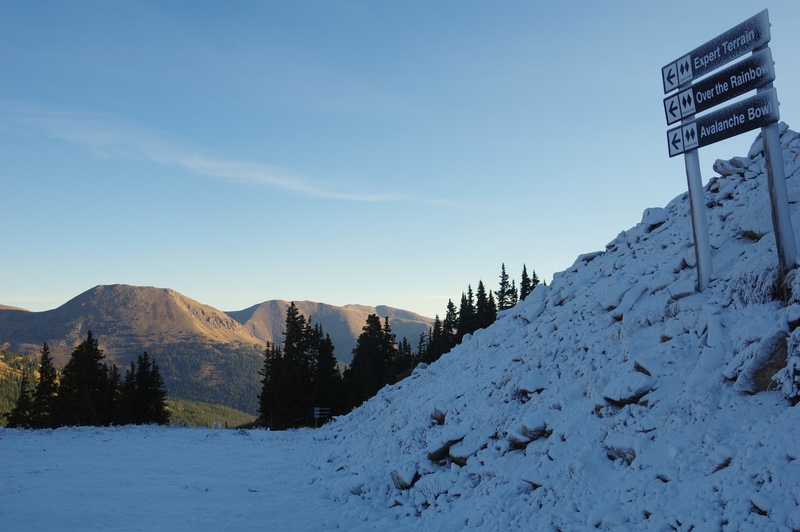 Overnight temperatures in Colorado’s high country finally got cold enough over the weekend for Loveland Ski Area to start snowmaking, joining Copper Mountain as the only other resort in the state blowing artificial snow in an effort to open for the 2015-16 ski season. Copper has been blasting snow on the U.S. Ski Team Speed Center downhill track in order to be ready for the U.S. Ski Team Naming and Opening Day on Friday, Nov. 6. Loveland still hasn’t determined when it will open for the season in what has been an unusually warm and dry fall in Colorado. Arapahoe Basin, which has opened the last two seasons on Oct. 17, beating Loveland out in the race to be the first ski area to open in the nation, had yet to start snowmaking as of Sunday morning. A-Basin and Loveland won’t enjoy first-in-the-nation bragging rights this season, which will go to Killington ski area. Killington opened on Sunday to season pass-holders, and will welcome the general public on Monday. Sunday River, Maine, also is set to open on Monday. Vail and Beaver Creek don’t open until Nov. 20 and Nov. 25 respectively. Colorado is expected to see more seasonal weather with a chance of showers over the next week or so, according to Opensnow.com.